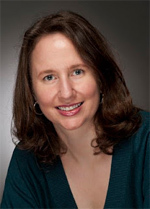 On March 28, 2012, we had a wonderful interview with one of the leading figures in motivational psychology, Heidi Grant Halvorson, Ph.D.
Heidi Grant Halvorson, Ph.D., is a social psychologist, consultant, and rising star in the field of motivational science. She is the Associate Director of the Motivation Science Center at the Columbia University Business School and has conducted research with the world’s leading figures in goal attainment. In this interview, she will talk about the most important strategies for goal attainment and the things highly successful people do differently. She writes weekly as an Expert Blogger for Fast Company, The Huffington Post, and Psychology Today, and is a regular contributor to the BBC World Service’sBusiness Daily, the Harvard Business Review, and SmartBrief’s SmartBlog on Leadership. Her writing has also been featured on CNN Living andMamapedia. In addition to her work as author and co-editor of the highly-regarded academic book The Psychology of Goals (Guilford, 2009), Heidi has published papers in her field’s leading journals, including the Journal of Personality and Social Psychology, Journal of Experimental Social Psychology, Personality and Social Psychology Bulletin, European Journal of Social Psychology, and Judgment and Decision Making. Her research and writing have received high praise from academics, business leaders, and authors including Carol Dweck and Matthew Kelly. Heidi received her PhD in Social Psychology from Columbia University. Recently elected to the Society for Experimental Social Psychology, she speaks regularly at national conferences, and applies her expertise as a consultant to the fields of education, marketing, and management. She has received numerous grants from the National Science Foundation for her research on goals and achievement. 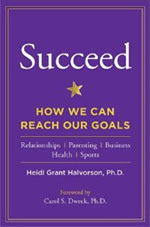 In 2010, Dr. Grant Halverson published Succeed: How We Can All Reach Our Goals, which has emerged as a “must-read” for individuals, groups, and managers focused on success or in a position to help others achieve their goals. It is filled with fascinating, easily readable research studies that highlight research-based strategies for success, and offers lists of recommendations for practical application to personal achievement and business settings. Enjoy Heidi’s website, blog, and favorite links on the Science of Success here. Heidi’s Harvard Business Review Blogs here. Heidi’s e-book Nine Things Successful People Do Differently here. HBR Idea Cast from Harvard Business Review — Interview with Heidi talking on her newest e-book. Nine Things Successful People Do Differently. The most successful Harvard Business Review blog post of all time–by far. The Science of Success Heidi’s Psychology Today blog.